Do you pride yourself on your appearance, putting your fashion and style first at all times? For those wanting a trendy and attractive coffee pot that meets their high standards, then the Vintage coffee pot is the perfect pot for those who live and breathe style. An attractive, sophisticated coffee pot, all items from the Vintage range are durable, practical and sturdy, promising years of enjoyment ahead of you. 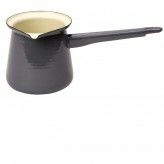 The large 1.2 litre coffee pot is hand-enamelled and is fired at 800C, making it strong, scratch, stick, chip and stain resistance, for enjoyment on every use. For those who are needing a versatile and practice coffee pot, the Vintage coffee pot is dishwasher, oven and hob safe, so if you are wanting to warm up your cold coffee on your induction hob, then this really is the coffee pot for you. Launched in 2012 to mark the end of 20 years, travelling across 3 continents in search of the best enamelware, the Vintage range has since been increasing in popularity and is the reason for the new, super sleek slate grey range. Whether you live in a modern house or have gone for a classic, French farmhouse inspired interior, you can be confident that this gorgeous coffee pot will look at home in your kitchen no matter your style. 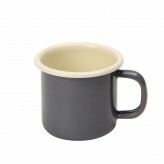 Retro style slate grey coffee pot from the Vintage collection featuring spout, handle and lid with a 2 litre capacity.